Kim Il Sung has established the idea of juche. Juche has to do with self-reliance, but is more than this simple translation. It is also an offspring of Marxism and Leninism, and you may add Maoism. “The masses are the origins of all revolution and are masters of that revolution.” Kim Il Sung thinks, that the process to find the will of the people is evolutionary and that it is cyclical. A cynical would tell you now, that’s what the North Korean society is doing now, going in circles rather than going forward. Somehow in this process the true will of the people shall be found culminating in chajusong (true freedom, independence). Interestingsly the masses according to the juche ideology are to be organized by a great leader. Songun may be translated as army-first, but is considered as “the realization that defense is the single most important role of state and ideology”. “The concept of Songun is to train all the masses as a people's army …” I think that North Korea has come to a high level of completing this task. All men between 16 and 26 serve in the army. Woman may join the army for 5 years. Self-reliance makes North Korea a lonely country on the world map. The military is draining the national economy to the utmost. But the juche ideology sees it differently, of course. Zu schreiten in die Nacht. Important is what you don’t see, a wise friend keeps telling me. Let’s have a closer look at some things or people that you don’t see. You don’t see homeless people, drifters, or the rural population leaving the villages to roam around the bigger cities. You don’t see people in rags. How could there be drifters? You can’t simply leave the village as you would be seen immediately. Everything is under control. You could walk as far your feet will get you, but you could not hop on the bus as there is none to bring you to farther destinations. In the cities there aren’t only the police, but there are also these two or three ladies at every street corner watching. You don’t see much intercity traffic though there are highways and railway tracks. No regular bus service, no train with merry old people, who had visited a sightseeing in the country and return home, which you see immediately after you cross the border to China. So people have to stay in the vicinity, where they live. There aren’t many good that are transported, so you have to live on the goods you produce regionally. You don’t see old or disabled people. If you are disabled and live on the 16th floor and you don’t have a working elevator, then you don’t leave you home much often. If you don’t have a wheelchair, especially an electric one, when you can’t move your legs, how could you move around? Maybe some people are kept out of sight on purpose, but most will simply not appear because of lack of transport. Your hardly see young men. Well some of them in other countries you would better like not see, like members of street gangs. But in North Korea it’s because of the long military service. That also means a drain of work force. You don’t see starving people, even if you go on long trips throughout the country. You see the well to do cooperative farms. You don’t see shrivelled corn; you see nice dark yellow corn being dried. How is it that you don’t see attributes of famine? You travel in the long stretched of good arable land. You don’t see the not so easy land strips, where corn doesn’t ripen or rice can’t be grown. Even the Great Leader Kim Il Sung had to face the fact that arable land in Korea is limited and can’t be expanded. What you see is any bit of land that is arable will be put into use. Where other countries simply have grass in front of apartment houses, you see salad, turnips, or cabbage. What does it mean in terms of environment protection? Corn is draining the soil. Monocultures like vast corn fields will lead to erosion and loss of fertile land. You don’t see starving people, but you see how slim the average North Korean is. So, even if the pictures aren’t showing starving people, you might be inclined to accept that there are people in North Korea, who are starving. http://en.wikipedia.org/wiki/Equilibrium_(film)) to real life in North Korea. You also might come to the conclusion that people go into the cellar to laugh. And then you hear people singing and laughing as the walk along the dark streets after a day of work (Kaesong). Or you see people laughing at public places. Do you see poverty and starvation in the Democratic People’s Republic of Korea? Yes and no. If you look at articles on the internet or the press you’ll find accounts of people, who wanted to find starving people, but didn’t succeed. This fact does not necessarily mean that there isn’t, but that conditions to find such things aren’t optimal. If you look at full faced “starving” children in these articles, you look at propaganda. If you read about the accusation of cannibalism, you read propaganda. I think, we better leave propaganda to the Stalinist state. Poverty stricken people in rags, which you are accustomed to from the poor countries of Africa, you don’t see them in North Korea. Actually you see properly clad people, you even see dandified kids visiting the Zoo (I know, you might argue that one only sees the children of the well doing cadre class). You don’t see beggars. You don’t see people starving at the next street corner. What you can see, however, is a society that is much slimmer than in the West, the US, or China. So people generally eat less than the overfed societies. This and the fact that people have to rely on walking and climbing stairs instead of car, public transport, or elevators, might even lead to the conclusion that the people of North Korea are healthier. Might be, might be not – if the well doing are slim, there might be even large numbers of people close to starving. Thought having travelled a couple of hundred kilometres through North Korea in 16 days, I wasn’t able to see these people. That doesn’t mean that there aren’t, it only means that one should be critical about revelations of certain reporters, who think that they can discover starvation on a four day trip. You might see poverty in buildings that are unrendered like most of the buildings in the city of Haeju. Or in the fact that people have to climb stairs because there isn’t a working elevation due to the lack of electricity – 20th floor might not be funny. You might see poverty in the lack of public transport. You see railway tracks but no train. You drive on highways with hardly any traffic. You see traffic wardens regulating an amount of traffic that doesn’t need regulating – though these women simply look good (OT). You can’t speak freely to people and the people you may talk with like guides or interpreters, however open they are with foreigners, avoid certain topics. No access to the internet, controlled cell phone network. North Korea’s situation is perhaps best described as moving in a traffic circle at the end of a dead end street. Day 1: 08:30 a.m. arrival in Beijing. 01:00 p.m. flight to Pyongyang.-Sightseeing Liberation Tower, Arch of Triumph, Monument to Victorious War. Check-in Yanggakdo International Hotel. Day 2: Taedong Gate with bell, Korean Art Gallery (opposite of Central History Museum), Underground, Central History Museum, Movie Studios with streets, Railway Museum..
Day 3: Drive to Myohyang Mountains, Pohyon Temple, hiking in the mountains, picnic at waterfall, Check-in Chongchon Hotel. Day 4: Visit International Friendship Exhibitions, drive back to Pyongyang, back to Yanggakdo International Hotel, Morangbong Circus (military circus), Tower of the Juche Idea, evening at May Day Stadium (Arirang). Day 5: Drive to Wonsan and then along the coast to Kumgangsan Mountains. Day 6: Hiking to Kuryongyon Falls, afternoon little hike to Manmulsang. Day 7: Hiking in Kumgangsan district, strolling around Lagoon Samil, Lake Sijung, Check-in hotel at Lake Sijung. Day 8: Chonsam Cooperative Farm, Ryangchon Temple, Anbul Temple, Wonsan Habour, Revolutionary Museum (Old Railway Station and Hotel), Songdowon International Children’s Union Camp, walking to the lighthouse in the evening. Day 9: Drive back to Pyongyang, on the way King Tongmyong’s Mausoleum, Jongnung Temple, Lunch in Pyongyang (including dancing with the waitresses and singing the International Anthem), Mt. Taesong, Kwangbop Temple, Ryonggang Hot Spring House. Day 10: Chongsan Cooperative Farm with Museum, West Sea Barrage, Mt. Kuwol, Woljong Temple, Mt. Suyang, Haeju, walk in the afternoon/evening. Day 11: Drive to Sariwon, Sariwon Folk Street, Pakyon Falls, Kwanum Temple, Kaesong Folklore Hotel, walking in the evening though the city (workers return home). Day 12: Walking to Kaesong Nam Gate, Mt. Janam with Kim Il Sung Statue, Songjuk Bridge, Sungyang Lecture Hall, Buddhist Temple, Koryo Museum with ongoing movie shooting, King Wanggon’s Mausoleum, King Kongmin’s Mausoleum (Twin tomb), and older tombs not yet restored. Day 13: Panmunjom, Lunch in the Demilitarized Zone, Mt. Jongbang, Songbul Temple, drive back to Pyongyang, Yanggakdo International Hotel. Day 15: Fountain park, Revolutionary Martyr’s Cemetery, Central Zoo, Central Botanical Garden, Obstetric and Gynaecological Clinic, Central Youth Hall. Day 16: Railway to Dandong (China) about 6 hours. It doesn’t seem so. There are no Buddhist worshippers at the temples. These temples are historical sites and aren’t places of worship. There are only a few churches and it isn’t clear if Korean people attend mass; some people from embassies do, however. But it isn’t a living religion of the Korean people. The reverence for Kim Il Sung and his family is growing into a religion. Relics are kept, for instance a chair on which the Great Leader had sit during a visit. Or the birthplace of the Eternal President Kim Il Sung it kept like a pilgrimage destination. It is depicted on steles in the villages “for the eternal life of President Kim Il Sung”, as it had been translated for me. There is the national heroes graveyard near the Pyongyang Zoo with the place of commemoration of Kim Jong Suk, wife of Kim Il Song and mother of Kim Jong Il. It may be compared to worshipping St. Mary. At least that’s the atmosphere. The pictures show Songbul Temple at the foot of Chonsong Peak (built in 898) and Anhwa Temple near Kaesong. Wo kommen wir nur her? Wo geh’n wir hin alsbald? No, I couldn’t go to see a movie. But I’ve seen kids going to the movies near the Arch of Triumph. People in Pyongyang go often to the movies, some statistics give 21 times per year. Also there wasn’t any activity going on at the Pyongyang International Cinema Hall, which is close to the Yanggakdo International Hotel, where I stayed in Pyongyang; actually each time in the same room, which had no other occupancy in between. More on the Pyongyang International Film Festival 2012 and filmmaking in Korea on http://www.korfilm.com.kp/index.php?language=eng . North Korea has a large movie production for the national market and Kim Jong-il is not only the Dear Leader, but also fond of movies and even directed movies. I visited the Korean Film Studio, which was founded in 1947. It covers an area of over 1 000 000㎡ in the suburbs of Pyongyang, from where you can see the pyramid-shaped Ryugyong Hotel (105-stories high). I couldn’t go into the studios, but have seen the streets for shooting Japanese, Korean, Western, Chinese scenes. While in Kaesong I also visited the Koryo Museum and there they were shooting a movie. In between scenes actors were yawning. But all in all it looked very professional. Während die Andullationstherapie sich nicht mit physikalischen Grundlagen beschäftigt, tut die Repuls, wahrscheinlich um mit allerlei dem Laien unverständlichen, physikalischen Geschwafel („REPULS erzeugt L i c h t bei einer Frequenz von ck. Hertz 10 74 ,4 14 ⋅ mit einer der absoluten Temperatur proportionalen Bandbreite von rund 2,5 %.“ oder „..., nicht nur mit dieser Frequenz, sondern bei kräftiger Erregung auch mit der d o p p e l t e n F r e q u e n z f2 schwingt.“) Wissenschaftlichkeit vorzutäuschen. Dann werden auch Anwenderberichte vorgelegt, die in schönen bunten Bildchen zeigen, wie erfolgreich REPULS ist. Allerdings erfüllen diese Anwenderberichte nicht die Kriterien für eine wissenschaftliche Studie, auch wenn sie sich den Anschein geben. Die schönste statistische Aufarbeitung von Murks in einer Grafik bleibt Murks! „Diverse Ärzte und Kliniken therapieren bereits erfolgreich mit REPULS® diverse Entzündungen ...“ – Entzündung mit Wärme behandeln? Wenn man sich verbrannt hat, lässt man dann heißes Wasser oder kaltes Wasser über die verbrannte Haut laufen? Na also! Insgesamt stellt REPULS eine über Licht durchgeführte Wärmetherapie dar, ist also keine besondere Innovation. Solange nicht eine wissenschaftliche Studie gegen die klassische Rotlichtlampe gelaufen ist, darf man ruhig bei der preiswerteren Lösung Rotlicht bleiben. There are new therapies, new strategies, but also new drugs based on existing strategies. The following gives an overview based on the abstracts of the EULAR 2011 Meeting in London. [SP0062] ADVANTAGES AND DISADVANTAGES OF BIOSIMILARS – ARE THEY GENERIC BIOLOGIC AGENTS? by V. Strand: Targets for ''biosimilars'' include etanercept (ETN), infliximab and rituximab. Disadvantages include that relatively small changes in manufacturing, characterization and/or formulation can significantly alter the efficacy, safety and/or immunogenicity of the biosimilar product. [OP0019] OFATUMUMAB, A FULLY HUMAN ANTI-CD20 MAB, IN THE TREATMENT OF BIOLOGIC-NAÏVE RHEUMATOID ARTHRITIS PATIENTS: A RANDOMISED, DOUBLE-BLIND, PLACEBO-CONTROLLED CLINICAL TRIAL by P.C. Taylor1 et al.A phase I/II study1 of OFA at doses of 300mg, 700mg and1000 mg administered as 2 infusions 2 weeks apart, …Conclusions: In this study, OFA treatment significantly improved all clinical outcomes in biologic-naïve, active RA pts without inducing immunogenicity. No unexpected safety findings were identified. [SAT0288] TOLERABILITY, PHARMACOKINETICS AND PHARMACODYNAMICS OF SUBCUTANEOUSLY ADMINISTERED OFATUMUMAB IN RHEUMATOID ARTHRITIS PATIENTS ON STABLE BACKGROUND METHOTREXATE: A PHASE I/II STUDY by R. Kurrasch1 et al.Conclusions: In this study of RA pts on stable MTX doses, SC OFA doses of 30, 60 or 100mg resulted in profound and sustained peripheral B-cell depletion. Single doses up to 60mg were tolerated. OFA SC may provide a method of achieving B-cell depletion without additional CS premedication. [SAT0292] SAFETY OF SUBCUTANEOUS ABATACEPT IN PATIENTS WITH RHEUMATOID ARTHRITIS (RA): INTEGRATED ANALYSIS OF FIVE CLINICAL TRIALS UP TO 4.5 YEARS by R. Alten1 et al.Conclusions: These pooled safety data, from 1879 patients with up to 4.5 years and 3086 p–y of exposure, demonstrate that SC abatacept has acceptable safety and tolerability. The safety profile was generally consistent with that of IV abatacept.1 Few SC injection site reactions were observed, which were mostly mild in intensity. [SAT0304] BMS-945429 (ALD518), A HIGH-AFFINITY ANTI-INTERLEUKIN-6 MONOCLONAL ANTIBODY, IS ASSOCIATED WITH IMPROVEMENTS IN HEALTH-RELATED QUALITY OF LIFE IN PATIENTS WITH RHEUMATOID ARTHRITIS AND AN INADEQUATE RESPONSE TO METHOTREXATE by V. Strand1 et al.Objectives: Here, we report health-related quality of life (HRQoL) outcomes from a Phase II randomized controlled trial of intravenous BMS945429 in patients ...Conclusions: Treatment with the IL-6 inhibitor BMS945429 resulted in statistically significant and clinically meaningful improvements in physical and mental aspects of HRQoL. Etanercept also works against Lymphotoxin-alpha. [OP0018] ANTI-LYMPHOTOXIN-ALPHA MONOCLONAL ANTIBODY: RESULTS FROM A PHASE I RANDOMIZED, PLACEBO-CONTROLLED CLINICAL TRIAL IN PATIENTS WITH ACTIVE RHEUMATOID ARTHRITIS by B. Emu1 et al.Conclusions: MLTA3698A was generally well tolerated across SD and MD phases in patients with RA. Preliminary evidence of clinical activity was seen in patients with active RA. FRI0380] SECUKINUMAB (AIN457) SHOWED A RAPID DECREASE OF DISEASE ACTIVITY IN PATIENTS WITH ACTIVE RHEUMATOID ARTHRITIS INCLUDING THOSE WITH HIGH INFLAMMATORY BURDEN by M. Genovese1 et al.Background: Secukinumab has been shown to improve signs and symptoms of patients with active RA in an ongoing phase II trial1 Conclusions: The results indicate that secukinumab provides a rapid reduction of disease activity with the greatest improvements seen in those patients on 150mg or 300mg who had evidence of high inflammatory burden as evidenced by baseline hsCRP levels. [FRI0174] THE ANTI-IL17A MONOCLONAL ANTIBODY SECUKINUMAB (AIN457) SHOWED GOOD SAFETY AND EFFICACY IN THE TREATMENT OF ACTIVE ANKYLOSING SPONDYLITIS by D. Baeten1 et al.Conclusions: The primary endpoint of this study was met, as AIN457 induced significantly higher ASAS20 responses than placebo at w6. No early safety signals were noted in this study population. Interim data presented here suggest that AIN457 may be useful for the treatment of active ankylosing spondylitis and thereby warrant larger long term studies on safety and efficacy. [SAT0243] ORAL SOLO (A3921045): A PHASE 3 STUDY OF ORAL JAK INHIBITOR TOFACITINIB (CP-690,550) MONOTHERAPY IN PATIENTS WITH ACTIVE RHEUMATOID ARTHRITIS: SUBGROUP ANALYSIS OF EFFICACY - POSTER TOURS by R. Fleischmann1 et al.Results: The Mo 3 ACR20 response rate was 59.8% (CP 5 mg) and 65.7% (CP 10 mg) vs 26.7% (PBO), p<0.0001. Conclusions: In this first Phase 3 study in pts with RA, clinically significant efficacy and acceptable safety vs PBO was demonstrated with CP 5 and 10 mg BID monotherapy at Mo 3 and in the majority of major demographic subgroups investigated. [SAT0240] TASOCITINIB MONOTHERAPY CAN PREVENT RADIOGRAPHIC PROGRESSION IN RHEUMATOID ARTHRITIS by J.W. Kim et al.Conclusions: In this pilot study, we found that a novel JAK inhibitor, tasocitinib can prevent structural damage of RA in respect of joint erosion and JSN. A large-scale randomized prospective study is warranted to confirm our result. Tasocitinib is the older name for Tofacitinib. [SAT0249] SAFETY AND PHARMACOKINETIC PROFILE IN HEALTHY VOLUNTEERS OF GLPG0259, A SMALL MOLECULE MAPKAPK5 INHIBITOR CURRENTLY IN A PHASE II RA STUDY by F. Vanhoutte1 Conclusions: GLPG0259 showed good safety and a PK profile supporting once daily dosing. Based on these promising results, a randomized, placebo-controlled multi-center Phase II dose-finding study was initiated in October 2010, where three dose levels of GLPG0259 will be evaluated in 180 active RA patients with an inadequate response to MTX. [OP0292] IDENTIFICATION OF GLPG0259, AN ORALLY BIOAVAILABLE INHIBITOR OF MAPKAPK5, AS A CLINICAL CANDIDATE FOR THE TREATMENT OF RHEUMATOID ARTHRITIS by M. Andrews1 et al.Conclusions: Compound screening and rational drug design were applied to generate a series of potent inhibitors of the novel RA target MAPKAPK5. Of these promising molecules, ... GLPG0259 is currently being evaluated in a Phase II trial in RA patients. These Phase II Study has already been stopped because of lack of efficacy. [SAT0246] AMAP102, AN ORALLY AVAILABLE 5-HT2 RECEPTOR ANTAGONIST DEVELOPED FOR THE TREATMENT OF RA, IS SAFE AND WELL TOLERATED IN HEALTHY SUBJECTS by A.-C. Ryde1Background: The 5-HT2 antagonism leads to a reduction of IL-6 and TNF-α, two important mediators of joint inflammation and cartilage/bone destruction. Conclusions: In this single and multiple oral dose Phase I study, AMAP102 was safe and well tolerated. The safety and pharmacokinetic profile of AMAP102 supports its further development. A Phase II study in patients with RA is planned. [OP0057] IMPROVED HEALTH-RELATED QUALITY OF LIFE IN PATIENTS WITH ACTIVE RHEUMATOID ARTHRITIS RECEIVING FOSTAMATINIB (R788) by M.E. Weinblatt1 et al.Conclusions: In this phase II study involving RA patients, 100 mg bid fostamatinib was associated with significant improvements in HRQoL outcomes including physical functioning, pain, fatigue, and overall physical health status. [SAT0247] PHARMACOKINETICS OF FOSTAMATINIB, A NOVEL SYK INHIBITOR, IN HEALTHY HUMAN SUBJECTS FOLLOWING SINGLE AND MULTIPLE ORAL DOSING by M. Baluom1 et al.Conclusions: … and is currently being evaluated in phase 3 clinical studies (OSKIRA trials) in RA. The oral JAK-Inhibitor Tofacitinib seems to be the most promising agent. And also the one, which might be available soon. Let’s see, what new developments will be shown at the ACR 2011 Meeting in Chicago during November. As for rheumatology we’re living in a very interesting time. A wedding is a big event, in the East as in the West. But North Korea still has to catch up. I might tell that there are small openings in the bulwark against happiness and feasting. 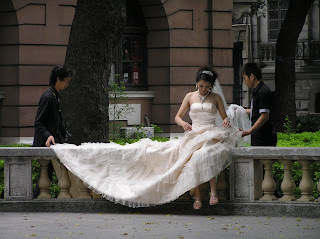 In China wedding photography plays a great role. I show two pictures, which I have taken in Guangzhou (广州) two years ago. This year in Shenyang (沈阳) I’ve seen equally equipped wedding photography booths in the main shopping area. North Korea doesn’t have this, or should I say doesn’t have this yet. I’ve at least two freshly married couples, who enjoyed themselves together with friends and who also did some photography. I’ve seen another couple in front of the botanic garden, but couldn’t take a photogtraph. You might wonder that you see lots of uniforms. Don’t forget that in North Korea young grown ups spend their life in the army. And they have never heard Status Quo “You’re in the army, now”. Gestern flattert mir ins Haus: „Ihre Gesundheitszeitung – wissenschaftlich, medizinisch, menschlich für €2,10“. Darin wird die sog. Andullation gepriesen. Der Artikel „Fibromyalgie – Chronische Krankheit und Mysterium“ spiegelt nicht den aktuellen wissenschaftlichen Erkenntnisstand wider. Zur Andullation kann man sich unter: http://www.esowatch.com/ge/index.php?title=Andullationstherapie#ixzz1aYWXjJNX informieren. [Nachtrag 04.07.2013: leider funktioniert der Link nicht mehr.] Wissenschaftliche Studien liegen nicht vor. Sieht man in den Foren nach, z.B. unter http://schmerzliga-forum.de/patienten/showthread.php?940-Andullation-kennt-das-wer-und-hilft-das oder http://www.gutefrage.net/frage/wer-kennt-die-andullationstherapie-und-hat-erfahrung-damit, dann läuft die Information darauf hinaus, eine besondere Liege für teueres Geld zu verhökern. „Im Bekanntenkreis konnte jemand (Rentner) der Werbung nicht widerstehen und hat seine Ersparnisse um 3500€ erleichtert“ berichtet Nogro (siehe oben). Ich rate vom Erwerb einer solchen Liege ab. "Übersicht zu Fibromyalgie / Fibromyalgie steht für Fasermuskelschmerz. Die Erkrankung, auch als Weichteilrheumatismus und Fibrositis bekannt, wurde erst im Jahr 1990 als eigenes Krankheitsbild beschrieben und anerkannt. Es handelt sich dabei um eine schwere, nicht-entzündliche chronische Erkrankung in der Muskulatur und in den Ansätzen der Sehnen." Das bewog mich nun zu einer Ergänzung. Die Erkrankung ist kein Weichteilrheumatismus und auch keine Fibrositis, auch keine Erkrankung in der Muskulatur oder in den Sehnenansätzen. Dort treten zwar auf Druck besonders starke Schmerzen auf, aber dort liegt der Schaden nicht. Anscheinend denkt man sich, mit diesem überholten Ansatz eine körperlich begründete Therapie besser verkaufen zu können. Auf http://www.andullationstherapie.de/ werden wir belehrt, was bei der Andullationstherapie geschieht: „durch gezielte Korrektur der Zellinformation“. Das ist wissenschaftlich völlig wertfrei, es bedeutet nichts. Es sagt nichts darüber aus, was „gezielt“ geändert wird. Im Text wird auf den „ungenügender Abtransport der Endprodukte von Stoffwechselprozessen“ hingewiesen, der durch die Andullation verbessert werden soll. Das ist nichts anderes als die Schlackentheorie, also das Entschlacken. Hier wird weder genannt, welches Abbauprodukt denn da gemeint ist. Schon gar nicht wird der Beweis erbracht, dass dieses Abbauprodukt auch vermehrt ausgeschieden/entfernt wird. Und schon gar nicht wird ein Nachweis erbracht, dass sich dann dadurch etwas bessert. Hier wird versucht, wilde Hypothesen/Theorien als Tatsache zu verkaufen. Der Text fährt weiter mit einer historischen Darstellung der Universität von Sevilla, wozu eigentlich? Um Text zu füllen? Um Seriosität vorzutäuschen? Sie können sich den zugrunde liegenden Originaltext auf Wikipedia ansehen: http://de.wikipedia.org/wiki/Universit%C3%A4t_Sevilla. Dort soll vielleicht die wissenschaftliche Forschung durchgeführt werden, auf die immer hingewiesen wird. Wenn Sie sich die Biografie von Dr. Stutz ansehen, dann können Sie einen bunten Lebenslauf entdecken - http://www.imr-switzerland.org/leitung.html. Er weist auf die Durchführung von „medizinischer Betreuung“ hin, ist aber Sportwissenschaftler und kein Arzt – merkwürdig. „Nachgewiesen in vielen klinischen Studien und anhand zahlreicher Publikationen belegt“ – dann könnte man doch darauf hinweisen – kann man aber nicht, da es das nicht gibt, jedenfalls nicht in der wissenschaftlichen Literatur. Wie könnte man den Verbraucher besser schützen? Wahrscheinlich ist das rechtlich schwierig, denn harte Nachweise einer Wirksamkeit sind nur bei Medikamenten gefordert. Andererseits sind mittlerweile auch für health claims (Gesundheitsbehauptungen) Richtlinien erlassen worden; Link: http://de.wikipedia.org/wiki/Verordnung_EG_Nr._1924/2006_(Health_Claims. Allerdings gelten die Richtlinien nur für Nahrungsergänzungsmitteln. Ob dies auch für andere Dinge gilt, müßte rechtlich geprüft werden. auf, d.h. die Arbeit stammt aus einer Fachzeitschrift, die ihre Arbeiten prüft, und sie steht zur Diskussion. Bei wissenschaftlichen Studien steht auch fest, wie der Therapieerfolg quantifiziert wird. Methode und Resultate werden detailliert aufgeführt. Das Novum in der Schmerztherapie! Therapievorschlag durch Onlinetest. Das ist für mich ein Hinweis darauf, dass mit der Andullation das große Geld gemacht werden soll. Leider oder verständlicherweise sind viele Antworten anonym. Man spricht aber von einer „Betrügerfirma“, „Geldmacherei“, „Betrug hoch³“. Lohnt sich, dort nachzusehen. Wahrscheinlich haben der Hersteller bzw. von ihm beauftragte Vertreter auch dort geschrieben, aber das ist meines Erachtens leicht zu durchschauen. im Internet steht viel über "Andullation" – und über Sie. Doch nirgendwo habe ich bisher gelesen, wo das Wort "Andullation" eigentlich herkommt - und was es in seinem Ursprung bedeutet/meint .....? Die Deutsche Gesellschaft für Andullationstherapie e. V. setzt sich für die flächendeckende Verbreitung dieses neuen biophysikalischen Verfahrens und hochwirksamer Therapie ein. Es soll gesundheitsorientierten Menschen im gesamten deutschsprachigen Raum zugänglich gemacht werden – ob im privaten Bereich oder in Praxen, Kliniken und Therapiezentren. Um dieses Ziel zu erreichen, haben sich Anwender der Andullationstherapie zu einem überregionalen Netzwerk zusammengeschlossen: Inzwischen eine beachtliche Anzahl von Ärzten, Praxen und anderen Therapieeinrichtungen, die miteinander kooperieren, sich mit Rat und Tat unterstützen und Informationen austauschen. Die Deutsche Gesellschaft für Andullationstherapie e.V. ist mit der Durchführung einer wissenschaftlichen Studie beauftragt, bei der die Wirksamkeit der Andullationstherapie bei noch mehr Menschen und noch mehr Krankheiten nachgewiesen werden soll. Wenn Sie mehr über die Therapie von Schmerzen mit der Andullation erfahren möchten und bisher noch keine Unterlagen erhalten haben, bieten wir Ihnen gerne an, den Schmerztest auf der Seite www.andullation.de in Anspruch zu nehmen. Hier können Sie zudem alle Informationen zur Andullationstherapie ersehen die Sie haben möchten. Sie erhalten dann per Post Informationen zur Behandlung von Schmerzen mit der Andullationstherapie, eine DVD, die Gesundheitszeitung sowie klinische Studien. Zu speziellen Fragen steht Ihnen gerne einer unserer Mitarbeiter persönlich oder telefonisch zur Verfügung. Bei weiteren Fragen bin ich gerne von Montags bis Freitags in der Zeit von 9.00 Uhr bis 18.00 Uhr für Sie da. vielen Dank für die Infos (s. unten) - nur leider haben Sie meine Frage (s. unten), wo das Wort "Andullation" eigentlich herkommt - und was es in seinem Ursprung bedeutet/meint .....? vielen Dank für Ihre Interesse an der Andullationstherapie. Bitte entnehmen Sie alle gewünschten Informationen unserer Homepage www.andullation.de. gut, dass ich Ihren Beitrag im Internet gelesen habe ! ! ! Die Herrschaften in Berlin sind offenbar nicht in der Lage (oder wollen es nicht ? ), mir das seltsame Wort „Andullation“ zu erklären: Siehe die unten stehende Korrespondenz. Wissen Sie, woher das stammt - oder wer es gar "erfunden" hat ? da treffen Sie den Nagel auf den Kopf. Es handelt sich um ein Kunstwort, dass sich die Betreiber ausgedacht haben. Einen Begriff, den man im Internet vergebens sucht. Er ist nicht in Wörterbüchern, etwa dem Duden, gelistet und Wikipedia hat den Versuch, es dort einzubringen, unterbunden. Wie man jedoch aus dem Wort ondulieren schließen kann, soll es etwas mit Wellen zu tun haben. Eine Definition erfolgt auf der Homepage des Vereins nicht. Aber Sie finden dort sehr viel verschleiernde, pseudowissenschaftliches Geschwafel. Das findet man übrigens auch in der Schulmedizin; wenn ein Sachverhalt klar ist und der Arzt sich auskennt, wird es auch dem Laien verständlich machen können, sonst wird häufig ebenfalls ein schwierig verständliches, fachwortreiches Geschwafel über Sie ergehen, um nur ja jede Frage im Keim zu ersticken. Hier wie da ist dann Vorsicht geboten, wenn einem die Gesundheit wichtig ist. Was können wir daraus ableiten? Es ist völlig überflüssig nach Sinn hinter dem Konstrukt Andullation zu suchen. Der Sinn ist wohl nur, dass man Geld verdienen will. Hier wird verschleiert und nicht informiert. http://www.freiepresse.de/RATGEBER/GESUNDHEIT/Andullation-Gesund-durch-Schwingungen-artikel8046725.php Freie Presse / Sachsens grösste Zeitung hat unter Ratgeber einen Werbeteil. findet sich nicht eine werbefreie Information, sondern, wenn man ganz weit nach rechts schaut, eine Anzeige, die aber wie ein redaktioneller Text aufgemacht ist. Wertfreie Informationen suchen Sie hier aber vergebens, Sie bekommen - Werbung. So sieht das dann beim MDR aus. Gute Recherche und guter Beitrag. Herzlichen Glückwunsch! Myohangsan lies about 150 km North of Pyongyang and besides hiking in the pristine countryside you are expected to view the exhibits in the two buildings of the International Friendship Exhibition. As a custom gifts are exchanged at state visits. In the West we don’t exhibit these gifts. Gift to Kim Il Sung and Kim Jong Il have been counted, coded, catalogized, and are to be seen in large rooms. You visit these rooms with polished floors an which you walk with cloth overshoes. Sure North Korea tries to stress the importance of both the Great Leader and the Dear Leader, but you see also reverance to the giver; especially to such persons as V. Putin. Nobody knows if these exhibits won’t get the status of reliques in the years to come. One flight of rooms stretched 300 m into the mountain. Who knows if there isn’t a nuclear safe command center behind the last rooms. From the top floor of Kim Il Sung’s International Friendship Exhibition you look into the mountains – and there you won’t see a path, only pristine, untamed forest and mountains. Als ich kürzlich durch die chinesische Stadt Shenyang (früher auch Mukden genannt) schlenderte, kam ich an einem Kaufhaus von C&A vorbei. In einem Schaufenster wurde mit der Stadt Dinkelsbühl und in einem anderen Schaufenster mit der Stadt Nördlingen geworben. Doch ach! Sie hatten ihre Umlaute verloren. Dinkelsbuhl und Nordlingen also. Das war eine schlechte Idee in einer Zeit, da Markennamen auch Umlaute haben, die gar nicht dorthin gehören, wie z.B. Häagen Dazs. You might expect a thorough search at customs and be right. Or you expects nothing and just a couple of polite questions are asked. We arrived by plane and were quite surprised by the no hassle handling of our arrival. Customs only packed the mobile phone of my friend and handed it over to our guide, who returned it by the end of our journey. We speculated, which of our “belongings” we should list on the small form for customs. At the airport no search of our suitcases. We took the railway out from Pyongyang to Dandong. A North Korean business man joint us in our compartment. Shortly before the border our passports were collected and customs entered the train. The thorough officer turned every carpet and looked behind the seats. We had to put our cameras on the desk to be inspected for unfavourable pictures, which were on the cards in abundance! But then he searched the business man’s purse and found a SIM card. He had licked blood. And he found a memory stick and another SIM card. We had to leave the compartment. Did the business man have to strip? Did he pay a bribe? We never found out. Then some CDs had to be played on the laptop, memory sticks were checked. Then they took the business man out of the waggon together with his laptop. We reentered the compartment and put our cameras away. Just before the train left North Korea, the business man came back. In searching him they didn’t have the time to go over my 2200 plus and my friends 1300 plus pictures. But it had been close. Finding one picture would have been enough to erase the card – at least those were the thoughts crossing our minds. You’ll have lots of quietness in North Korea, a country with hardly any traffic and no night life at all. You may drive on motorways without jams. But you might also wait for a train to come that won’t come. Would you miss the deep sound of motorbikes? The throbbing of cars in eight parallel lanes? I didn’t. Yet some North Koreans think that this only shows a stagnant society. Tranquillity. In the Buddhist temples you might find peace of mind. Some monks will only be pretending and know more about the times Kim Il Sung visited the area than about Buddhism. But that’s another story. While visiting Beijing last week I had the opportunity to meet with a friend, who cannot access Twitter since 2009 as the Chinese government stopped Twitter in China. Maybe you remember @shixianjia or @rosemary0 from this time. I’ve met Rosemary at the Summer Palace (颐和园) and we took a bus to Longquan Temple (龙泉寺), which takes quite a while as the temple lies in Beijing Fenghuangling (Phoenix Mountain) Nature Park (北京凤凰岭自然风景公园) outside of the city; it is 51 kilometers away from Tiananmen Square and 23 kilometers from Summer Palace. We’ve met Sheila and the three of us visited some of the temples walked over the old stone bridge, or sat beneath a shady Gingko tree. The Longquan Temple had been built initially in 951 and is the first Buddhist temple that had been formally opened in Beijing’s Haidian District. While walking in the vicinity of the stupa, Rosemary suddenly told Sheila, that she had a mosquito on her forehead. She tried to help her get rid of the mosquito, but it was already sucking blood. Sheila told her to let it go, as it will drop off, when it has sucked enough blood (吃饱了), which the mosquito did. Thank you, Sheila for demonstrating how far Metta can reach.